NEF UK and the Gegharkunik Chamber of Commerce and Industry (GCCI) organized a special event that included a presentation and exhibition on Advancing Gender Equality and the Rights of Survivors of Gender-Based Violence in Armenia, a project financed by the European Union and implemented by NEF UK and GCCI. The event, held on January 18 2017 at the Double Tree Hilton Hotel in Yerevan from 14:00 to 18:00, provided an opportunity to explore the role of Armenian civil society organizations, private sector organizations, and government agencies in promoting women’s rights and gender equality among vulnerable groups of women through the delivery of economic development programs. Ms. Line Urban, a representative from the European Union (EU) delegation to Armenia, gave opening remarks at the event where she emphasized the important role the program has played in advocating for gender equality in Armenia. NEF UK and GCCI highlighted the impact of the EU-supported project and showcased an exhibition of project beneficiary business products and services. Attendees were also able to hear directly from beneficiaries who shared the successes they have achieved through the project. The event helped attendees to identify the primary causes of gender-based violence in Armenia, what role they can play in the prevention of gender-based violence, and how their organizations can help support the economic stability of survivors in the future. The key findings of the three working groups (government agencies, civil society organizations, and victims of gender-based violence) were shared and discussed among participants at the end of the event. The project is being implemented in Yerevan, Syunik, and Lori regions in partnership with the Women’s Support Centre, Women’s Resource Centre, Goris Women’s Development Resource Centre Foundation, and Spitak Helsinki Group. Since its launch in January 2015, the two-year project has helped 230 survivors of gender-based violence gain increased employability, small business skills, and establish small businesses. Seventy women received vocational training in various specializations, 130 received financial support to start their small businesses, 80 developed career development plans, and 50 women found employment in the labour market. The project has helped build a commitment toward preventing gender-based violence and promoting gender equality among community leaders and employers. 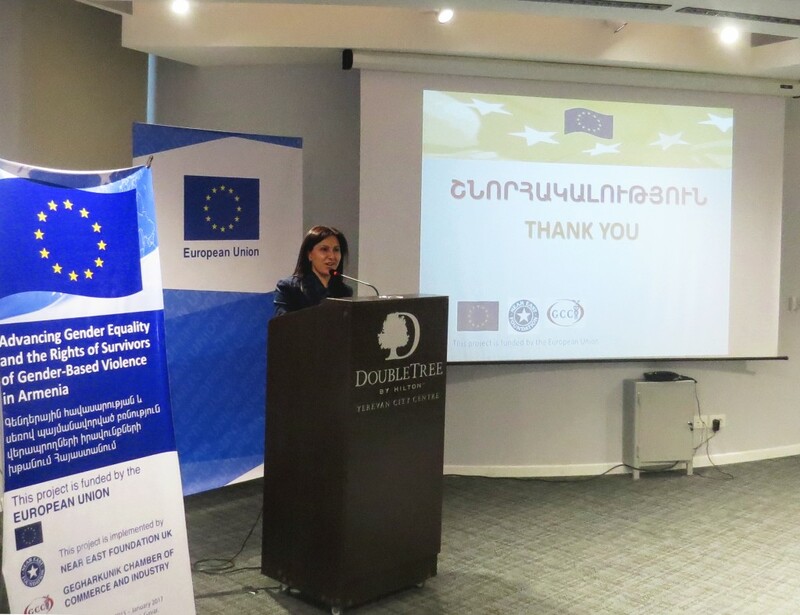 The partner community organizations have strengthened their cooperation and signed agreements with regional agencies in Armenia, aiming to create referral mechanisms for victims of gender-based violence. Although the project ends on January 20 2017, NEF UK and its partners hope to find opportunities to continue this work, as it is highly impactful and required. Project’s learning, lessons and recommendations will be presented at an event in Yerevan in March 2017.